The Summer Solstice has arrived and its a good time to update on moulting progress for Tahoe’s adult plumage. Feathers continue to drop each day, mostly body feathers by now. Several of the deck feathers and primaries still remain, but I’m sure it’s soon to change. I’ve already started to see the adult red-tail feathers grow out beyond the body and contour feathers, it’s very exciting to see them already. 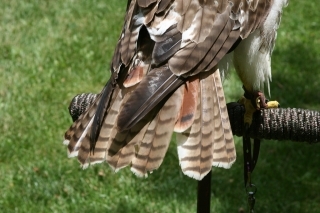 As she loses more body feathers, the mottling of the immy-brown feathers and the adult-body feathers becomes more apparent. The adult feathers are two shades darker, almost black compared to the brown feathers. I’m super excited to watch her transform her colors. I’ve received many compliments on her plumage, with many companion falconers commenting that she would be a dark bird as an adult. At this stage in the game, it’s certainly appearing that way. Until next time!